Scientists have made a major breakthrough by making extremely thin and flexible photovoltaic cells. Apart from those characteristics they are also extremely lightweight, how light? Well let’s just say that they can rest on top of the surface of soap bubble without popping it! It’s just a proof of concept for now and is expected to progress in the near future however the characteristics and the versatility of the whole concept make it so interesting for us to know. The point is how the scientists actually managed to make such a cell which is so light and thin at the same time, as per the report the key to this success is the way the solar cell is combined itself. Adding to that, the substrate as well as the protective coating that the researchers used in the process of making this solar cell is what makes it so unique in nature. Since the researchers made the cell and the substrate grow together, they prevented the substrate from getting contaminated from dust and other impurities. Parylene, which is a very flexible and commonly used polymer, was used as a substrate and for over coating as well. Also, DBP (dibutyl phthalate), which is an organic material was used as a primary light absorbing layer in the process. The process takes place in a vacuum chamber, not including any solvents or chemicals and is working at room temperature. Moreover vapor deposition technique is used to make sure that a very thin coating of the material is made and here the cell and the substrate are made to grow together. In fact, they may be too thin to be practical: “If you breathe too hard, you might blow it away,” said Joel Jean, another of the researchers involved. 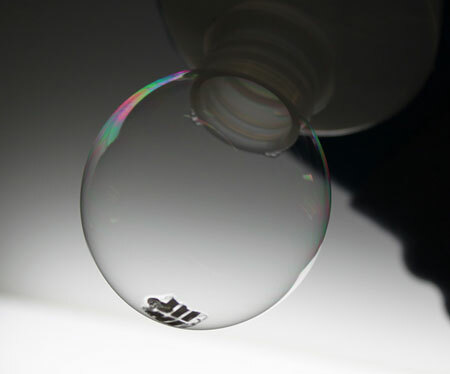 According to the researchers who made this, the vacuum based layering can be used anywhere particularly to deposit solar cells on any material may it be fabric, paper or a soap bubble. However this is subject to some work and more research before it will actually work at massive scale. Still it is incredible what how much science has progressed, please let us know your thoughts in the comments below.